a site of extreme sensitivity in acute appendicitis, situated in the normal area of the appendix midway between the umbilicus and the anterior iliac crest in the right lower quadrant of the abdomen. See also appendical reflex, appendicitis. 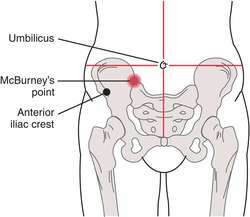 The point on the right lower flank—midway between the anterosuperior iliac spine and belly button—that corresponds to the appendix; finger pressure on McBurney's point elicits a major pain response from patients with acute appendicitis. Physical exam The point on the right lower flank, midway between the anterosuperior iliac spine and belly button, that corresponds to the appendix; finger pressure on MP elicits a major pain response–Dang!, that HURTS–from Pts with acute appendicitis. See Appendicitis. 2% Table 11 B-M Livingstone's SIGN Our series series (4) Hyperasthesia 80% 86% Table 12 SIGN Our series Adiga's series (2) Tenderness at McBurney's point 98% 100% Rebound tenderness 88% 74% Table 13 SIGN Our series Adiga's series (2) Rov-sing's sign 30% 19% Table 14 SIGN Our series Adiga's series (2) Obturator test 14% 12. In other studies carried out to prove its validity and a study based on 275 double contrast radiographies with barium enemas found that only 35% of the bases of the appendices were found in the 5 cm range of McBurney's point, while 15% were at more than 10 cm away in distance. Tenderness is often maximal at or near the McBurney's point when the inflamed appendix lies in the anterior position.